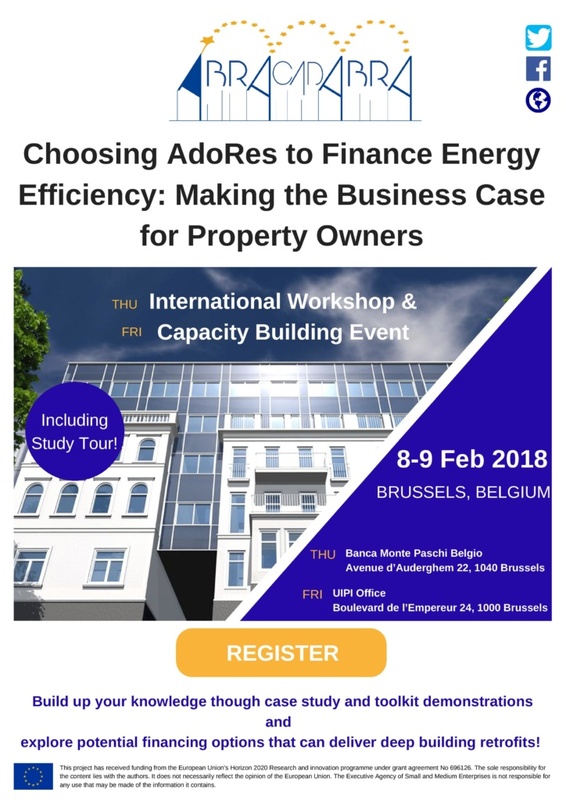 On 8 and 9 February 2018, an International Workshop and Capacity Building Event on “Choosing AdoREs to Finance Energy Efficiency Renovations: Making the Business Case for Property Owners” took place in the framework of the ABRACADABRA Project (Horizon 2020) in Brussels, Belgium. The event brought together a wide range of stakeholders including national and European property owners, real estate sector and building professional representatives, as well as EU institutions, national and local authorities, financing institutions, researchers and practitioners. Finding solutions to finance energy efficiency renovation in the building stock, in particular for the private residential stock, is one of the biggest challenges to reach EU Climate and Energy objectives. This event aimed at identifying solutions to overcome potential constraints and hurdles of private property owners to engaging in energy efficiency retrofitting of their buildings by exploring the potential advantages of building additions. The presentation of a number of inspiring cases and two podium discussions were dedicated to discussing the potential and attractiveness of building addition solutions for property owners and share best practices to overcome potential regulatory, societal and technical problems. Based on the assumption that non-energy related benefits can play a key role in the deep renovation of existing buildings, it was presented if, when, where and how a building addition or expansion can increase the real estate value of buildings though energy and architectural transformation, generate additional rental income or bring additional cash flow as a result of property sale. Additionally, Guidelines for Property Owner Associations on how to promote the AdoREs strategy were presented, gathering valuable input from attendees on further development. On the second day, the Capacity Building event was aimed at demonstrating the benefits of AdoREs using a set of toolkits (technical, financial and regulatory) which are being developed in the framework of the ABRACADABRA project. The case studies presented and tested a social housing building in Belgium and a French privately owned multi-apartment building and the feasibility of using building additions and renewables for energy efficiency retrofitting. Next to that, a presentation was held by a Norwegian architect from OPA Form on building additions in single-family houses.